When you are aware and conscious, perfection is incessant. The spontaneous living of a sage, a Realized Soul, a Prophet is always perfect. As human beings, our capacity and potential to unfold is unlimited. The Creation is perfectly made: see it clearly as it is. 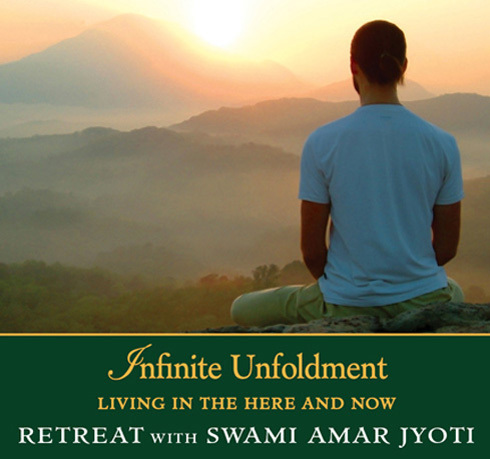 Given at Blue Lake Camp in Muskegon, Michigan in 1984, the Infinite Unfoldment Retreat by Swami Amar Jyoti reveals how to unfold naturally on the path to Enlightenment. Living in the here and now is the greatest freedom; wisdom unfolds when we see clearly, honestly and sincerely. In the process of unfoldment—not by achievements or accomplishments—life blooms and inner consciousness opens effortlessly. Gurudeva speaks on karma and lessons of Earth onsciousness, disciplines and practices to uplift the mind, and why projections interfere with God’s working. The goal of meditation, samadhi, is perfect stillness from which Oneness emerges.